Details of the year-long surveillance operation remain classified. But information made public in recent weeks shows the main focus of the FBI spying was Page, a volunteer foreign policy adviser to the Trump presidential campaign, and not Russian nationals. The FBI's surveillance of Page began in October 2016 and lasted for a year. It appears to have been a dry hole for FBI counterspies seeking linkage between the Trump campaign and the Russians. What the case has produced instead is a fierce political backlash from congressional Republicans along with President Donald Trump. Both have decried what appears to be the illicit and possibly illegal use of the Foreign Intelligence Surveillance Act to spy on and discredit Donald Trump and his associates. Trump tweeted Feb. 3 that a declassified House memo exposing FISA surveillance abuses vindicated his criticism of the special counsel investigation led by former FBI Director Robert Mueller into allegations of Trump-Russia collusion to defeat Clinton. "But the Russian Witch Hunt goes on and on. Their was no Collusion and there was no Obstruction (the word now used because, after one year of looking endlessly and finding NOTHING, collusion is dead). This is an American disgrace!" Trump said. Angelo Codevilla, an intelligence expert who opposed creation of FISA in 1978 while working as a Senate staff member, said determining the success or failure of the Page surveillance is difficult because the results of the surveillance are secret. But Codevilla believes the most likely motivation behind the spying was political. "I believe that Page was the excuse for surveilling the entire Trump operation," he said. "Merely surveilling Page was a crime, all right," Codevilla said. "But it was also wholly useless. Nothing that Page did or failed to do mattered, or would impress anybody. Why go through the trouble to get stuff on him?" It is possible, Codevilla said, that those who ordered, approved, and carried out the surveillance were simply incompetent, or perhaps were responding to political pressure to "do something" in response to allegations contained in the controversial dossier produced by former British intelligence agent Christopher Steele, who would be exposed as an anti-Trump crusader. The House memo states that FBI's counterintelligence chief, Assistant Director Bill Priestap, revealed FBI counterspies had not verified the salacious information in the Steele anti-Trump dossier when the initial FISA warrant was approved in October 2016. That indicates the FBI did not have a solid legal or intelligence basis for seeking surveillance of an American. What is clear is that the FBI was under pressure from the CIA, the State Department, and Congress to take action in response to the Steele allegations. Obama's CIA director, John Brennan, one of the more partisan agency leaders, told Congress he pressed the FBI in the summer of 2016 to investigate unspecified contacts between Trump associates and the Russians. In the Senate, the powerful chairman of the Senate Armed Services Committee, Sen. John McCain (R., Ariz.), would pass the dossier to the FBI in December 2016, likely contributing to the renewal of the questionable surveillance by the FISA court. This week a new twist in the ongoing investigation of the FISA abuses was revealed. On Thursday former State Department official Jonathan A. Winer, said he disseminated reports from Steele to the State Department beginning in 2013. "Over the next two years, I shared more than 100 of Steele’s reports with the Russia experts at the State Department, who continued to find them useful," Winer stated in the Washington Post. Winer disclosed that in the summer of 2016 he discussed the Steele allegations of Russian collusion with Clinton confidant Sidney Blumenthal, and that notes were supplied to the FBI through journalist Cody Shearer. Throughout the period of the Page surveillance, however, the FISA requests signed by FBI and Justice Department senior officials did not reveal to the secret court that the Steele dossier had been funded by the Democratic National Committee and the Clinton presidential campaign through a law firm. The omission of the funding source thus put the FBI and Justice Department in the awkward position of spying on the Republican presidential campaign based on information that was paid for by the Democratic presidential campaign, suggesting a political spying operation against Trump and his aides. Another possible motive for the FBI's counterintelligence targeting Page was that he may have been a target of convenience in the aftermath of the FBI's unusual exoneration of Hillary Clinton in July 2016, when FBI Director James Comey ended the investigation with a recommendation that the Justice Department not prosecute her for mishandling classified information. By opening a counterintelligence probe of Russian targeting of the Trump campaign, Comey may have been seeking to compensate for his apparent interference in the political campaign. Comey approved the initial FISA warrant. The Steele dossier became the centerpiece of the counterintelligence probe even though its information was unverified. The dossier was produced for Fusion GPS, a research firm run by former journalists, and was paid for by funds from the Democratic National Committee and Hillary Clinton presidential campaign. Page declined to comment on the counterintelligence probe. An FBI Spokesman declined to comment. The Washington Free Beacon hired Fusion to conduct research on GOP presidential campaigns but had no role in the Steele dossier. 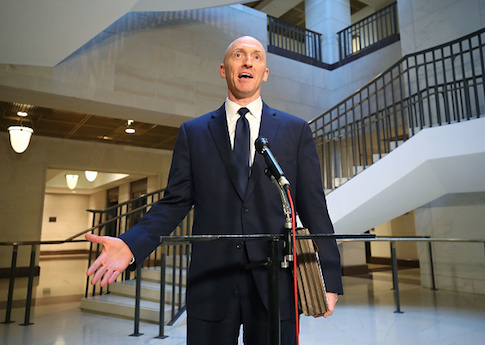 A congressional memo produced for Republicans states "the Steele dossier formed an essential part of a FISA application targeting Carter Page." "Former FBI Deputy Director McCabe confirmed that no surveillance warrant would have been sought from the Foreign Intelligence Surveillance Court (FISC) without the Steele dossier information." According to the declassified House memo on the FISA abuse, the first secret FISA court warrant was approved Oct. 21, 2016, at the height of the presidential election campaign. It also was approved a week before Comey informed Congress he was reopening the Hillary Clinton private email investigation based on additional emails found on the laptop computer of Anthony Weiner, then-husband of Clinton aide Huma Abedin. Clinton would later blame Comey's October re-investigation with causing her to lose the election, even though the FBI would later say no additional classified information was found. Codevilla said the Page surveillance may have been an attempt to cast a wide net that included other surveillance targets in addition to Page. "We won’t know unless the entire take is made public," he said. FBI guidelines for domestic operations permit conducting intelligence-gathering that does not involve violations of law. However, the guidelines state "United States persons shall be dealt with openly and consensually to the extent practicable when collecting foreign intelligence that does not concern criminal activities or threats to the national security." Another intelligence specialist, Ken deGraffenreid, believes the FBI counterintelligence probe of Page was faulty because the Bureau has lost the effective counterintelligence capabilities it once had. That is evident in the FBI's record of failures in handling foreign counterintelligence cases. For example, in the early 2000s it was revealed the FBI had been fooled for years and supplied false intelligence on China that was sent to the highest levels of the government by one of its recruited agents, Katrina Leung. Leung was found to be a double agent working for Chinese intelligence who compromised numerous FBI operations and sources. Her FBI handler, Agent J.J. Smith, also violated fundamental procedures by having an affair with Leung, and by denigrating other legitimate Chinese sources in favor of mainly relying on bogus intelligence provided by Leung. FBI counterintelligence agent Peter Strzok, who was a key agent in both the Clinton email probe and the special counsel investigation led by former FBI Director Robert Mueller, was involved in an affair with FBI lawyer Lisa Page, which led to his dismissal from the Mueller probe. That romantic relationship also violated FBI rules because the relationship made Strzok vulnerable to blackmail. Some 50,000 text messages between Strzok and Page reveal the couple spent a lot of their time exchanging messages, many of which were critical of Trump and indicated support during the presidential campaign for Clinton. A more serious FBI counterspy failure was the espionage investigation into CIA counterintelligence official Brian Kelley. From 1998 to 2001, FBI agents were convinced Kelley was a operating as a Russian intelligence mole inside the CIA. Kelley, who died in 2011, was suspended from his CIA post during the lengthy probe and hounded by FBI counterintelligence agents who refused to believe his assertions of innocence. Kelley said in an interview over 10 years ago that bureau agents went so far as to contact his ailing mother in a nursing home to tell her their son was a traitor, in a bid to force him to confess. The probe lasted until a Russian intelligence defector sold the FBI a tape recording of the real mole, who would later be convicted for being the spy turncoat FBI Agent Robert Hanssen. The case of Carter Page, however, does not appear to have any link to espionage. Page was first questioned by FBI counterspies in 2013 as part of a case against two Russian intelligence officers in New York City. One of the Russians, Victor Podobnyy, had tried to recruit Page as a source of information about energy issues. Court papers in that case identify Page only as "Male-1." But Page later told Congress he believes the FBI deliberately leaked his identity in the case to news outlets. "I played no role in any government active measures in the 2016 election other than being a target of the Obama administration’s efforts to support Mrs. Clinton’s campaign," Page wrote to the House Intelligence Committee in May 2017. During two trips to Moscow in July 2016 and December 2016, Page said no Russians approached him to indicate Moscow was trying to influence the U.S. government or the 2016 election. DeGraffenreid, former deputy national counterintelligence executive during the George W. Bush administration, said the surveillance of Page does not appear to involve espionage, as occurred in the FBI's surveillance of Kelley over a decade ago. The problem for the FBI is they lack the skills to conduct counterintelligence, the difficult task of identifying and countering foreign intelligence service operations that often requires skills beyond the legalistic training of FBI agents. "The Bureau has moved further and further away from real counterintelligence," said deGraffenreid, who clashed with the FBI over needed reforms during his time as a senior counterintelligence policy official. The problem, he said, is that the FBI remains chiefly a law enforcement agency and cannot properly conduct non-law enforcement counterintelligence activities. "One of the reasons the FBI has been so weak and hesitant to do anything about Soviet and now Russian active measures, is because they often do not involve crimes," he said. "Just trying to influence people and governments goes on all the time and the Bureau is very reluctant to get into that." Unless the FBI or CIA develops intelligence sources inside of Russia's FSB security service or SVR intelligence service, conducting counterintelligence operations against their activities in the election would be very difficult, he said. The FBI in the past was able to develop such penetrations that provided leads for counterspies. For example, in the 1950s, the FBI recruited the No. 2 official in the American Communist Party, Morris Childs, who worked as a clandestine FBI agent until retiring in 1982. Childs, because of his Party connections, gained access to Kremlin secrets that were passed to the FBI. Based on the FBI's scant record of uncovering Americans in government working as agents for foreign intelligence, it is unlikely the FBI has such sources that can provide leads for counterspies. Most of the FBI's counterintelligence successes have been the result of foreign defectors who revealed American spies, not from unilateral FBI operations. The most recent FBI success in uncovering Russian spies involved the arrest of 10 deep-cover "illegal" spies in 2010. The illegal spies were posing as Americans and thus could have been prosecuted for espionage. Instead, the Obama administration allowed the 10 spies to leave the country without even vetting them for intelligence that could have assisted FBI counterintelligence activities. This entry was posted in National Security and tagged FBI, Justice Department, Trump Administration. Bookmark the permalink.